Headmaster Jack Cork is loving life at Turf Moor after his summer move from Swansea City. Cork capped a “mad week” that saw him earn his first England cap by netting the opening goal against his former club, as Burnley made it three successive wins in the top flight for the first time in 42 years. It was Cork’s first Premier League goal for the club since May 2010, a memorable header against Spurs in the first of two loan spells at the club. He has started all 12 league games since his close season switch, and it seems to have brought the best out of himself and the team, with Burnley the shock troops of the division, sitting seventh, four points from second. Cork said: "I feel good, I feel fresh, I feel confident. Maybe it’s the move and the new environment, that can always help things. “It’s been one of those mad weeks you have in your life. You don’t get many of them so you have to enjoy them when they do come around. 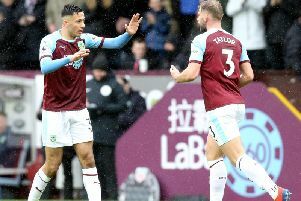 Ashley Barnes lashed in the second against Swansea just before half-time, to give Burnley another three points in a season which has seen them only lost twice all term - with only leaders Manchester City losing fewer games: “It’s unbelievable. "We keep saying we looked at the fixtures at the start, and it wasn’t easy to see where we could get the points away from home. We’ve been fantastic and we have to keep this form going until the end of the year and then see where we are. “We don’t want to get carried away. I’ve been at clubs where we’ve got a bit carried away and then you get brought back down to earth. Cork’s goal heaped the pressure on Swansea boss Paul Clement after a sixth defeat in seven league games, but he hopes his former manager and club get out of their current predicament: “I’ve known him for years, we’ve been close for a few years. He just wanted to know how I was and how the family were. “I was with him for a few years at Chelsea, going back to when I was a kid at 15, 16. He’s been a really big part of my career and when I was coming through the youth team. I’ve always been close to him. Clement said he had no regrets over the sale of Cork, albeit intimating it wasn’t necessarily his decision, and Cork added: “I think it maybe wasn’t his decision. They bought me for £1.5million, the bid came in from Burnley, which was a lot more than they paid, and they were obviously trying to raise money to bring more midfield players in. “He said to me, ‘look, you’ll probably play more games there, the club will probably accept the bid, what do you want to do?’. “As soon as he said it, I thought’ ‘yeah, why not?’.